Schedule a private tryout for the Columbus Sharks! Sponsor a Columbus Sharks player! Tryouts are Sunday, September 20th at 5pm at Diley Middle School, located at 750 Preston Trails Dr., Pickerington, OH 43147 at 5:00pm. Registration is not required. 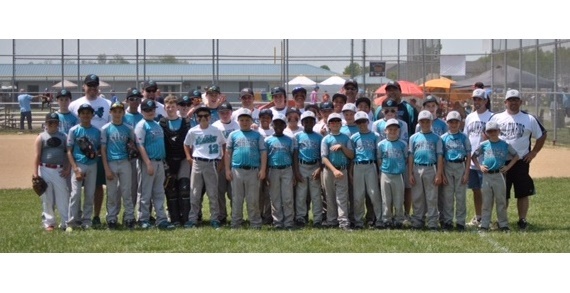 The Columbus Sharks was created to offer talented and motivated baseball players a chance to play against other competitive teams. Players have opportunities to improve their individual baseball skills and to learn team strategy with an emphasis on dedication and perseverance needed to play competitive baseball. Currently the Columbus Sharks is managed by former Sharks coaches and players. The Columbus Sharks is a 501(c)3 non-profit corporation; no officer or board member receives compensations from any team that participates in the Sharks organization. All fees collected for each team stays with that team for their baseball related operating costs. The goals are the same as Ken Maxwell’s and Joe Fryer’s when they started the Sharks back in 1996: to help young men learn to work and play hard with a goal in mind; understand good baseball fundamentals; sportsmanship; how to win or lose and to learn from both and finally to help them love the game the way the Columbus Sharks does. The Columbus Sharks hopes you choose to become part of The Columbus Sharks baseball family and our long standing tradition!